Did you know that February is National Heart Healthy Month? It makes sense that the American Heart Association has linked heart health to February since Valentine's Day is smack dab in the middle of the month and the world is glittered with hearts, candy, love and affection. I'm a firm believer that if you love someone, you will fix them something that will help prolong their life and something that tastes good, too. When I first started this blog, 8 out of 10 recipes I posted were heart healthy because I was a guest chef at a health and wellness center and I culled most of my recipes from the classes I taught there. Every ingredient was low or no-fat, reduced calorie or sugar-free. Over the years I've changed my diet and my cooking style and instead of relying on pre-packaged "healthy" foods, I'm all about real, natural whole foods. While I still buy skim milk, today I'm more likely to use real butter (in moderation) and discard anything that is essentially a chemical $%&* storm. Speaking of storm, North Carolina is under threat of a winter storm and I've been under the weather as of late. Plagued with a soul-crushing bought of sinusitis with a touch of the flu with a very high fever that lasted for three days, today is the first day I've felt like a normal person. Today is the first day that I've felt well enough to cook for myself. Lucky for me, it's Sunday and it's the only day I'm committed to cooking dinner. I think a big saucier pot of these greens will help me continue on the road to recovery. What do you think? I'm slightly obsessed with collard greens right now and I've been eating them with nearly every meal. While kale is all trendy and the preferred dark, leafy green of the day, I prefer collard greens because I grew up eating them every which way. The most common way in the south is boiled to death with pieces of fat back or bacon, lots of salt, onions, spice and doused with vinegar. These greens don't taste like any of that. 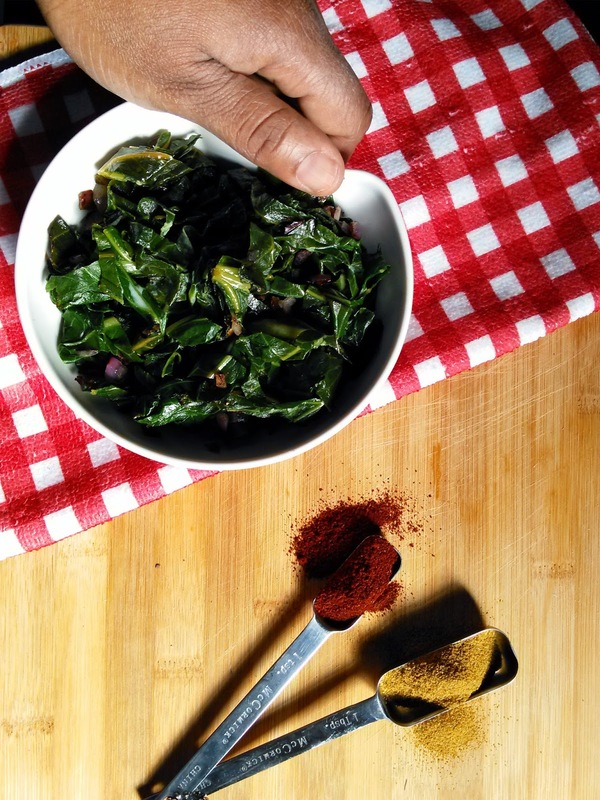 Hearty collard greens or spiced just right with toasty cumin and smoky paprika and accented with fresh herbs, onions and heart-healthy olive oil for a Mediterranean taste. I love these greens. And I think you will, too. Collard greens are a favorite to use in this recipe but don't limit yourself. Be creative and use hearty romaine, peppery arugula, sweet escarole, delicate watercress, baby spinach, turnip or beet greens, trendy kale or rainbow chard to add a little color to your table. Warm the oil in a wide skillet over medium heat. As soon as the oil releases its flavor and starts to shimmer, add the shallots, then the greens and the garlic/herb mixture. Cook, stirring frequently, until any extra moisture has evaporated. Serve. Staying healthy doesn't mean giving up desserts! These with pepper sauce is a perfect side dish! Or actually I could make a meal of them with some cornbread. We love greens of all kinds and it is one of our favorite veggies to have on the side with our meal. Looks delicious. Most of the dishes I make at home are whole, and homemade as well...It's more time consuming, but I love it! I'm not the biggest collard fan, but my husband is! I bet he'd love this. Get rid of the chemicals...I so so so agree! I love your greens. The spices and whole food approach won me. Yum! We don't get collard greens up here, not sure if I have even had them before but they look fantastic all spiced up too! we really like collards here! need to try with this spice combination. You always have such creative recipes, I love them! This sounds like the perfect side dish to me! Love me some collard greens ... and the addition of cumin and paprika is awesome! I love, love, love collard greens with vinegar and hot sauce. So good! I first had collard greens when I visited a friend in Memphis years ago and loved them. Your version with cumin and paprika sounds fantastic! Collard greens are so delicious! Anytime someone tells me they don't like them I think it's just because they have never had them properly prepared. This recipe looks scrumptious and I love the addition of cumin. These sound wonderful! It's been too long since I've had some good greens! We are VERY into greens at our house - but I have to admit we don't cook collard greens very often! I'm giving this recipe a try very soon! My first time trying collard greens was only a few years ago, and I love how they maintain more of a bite than kale or spinach when cooked. I really should make them more often! I do something similar with kale - what a great flavour combo! Glad to hear that you're greening better! I miss collards so much since moving from the city. These sound absolutely perfect! This is definitely the right way to kick things off - I love good, simple collard greens! we're totally on the same page - I'd much rather have moderate amount of real food than something full of chemicals. These collard greens look amazing. I don't think I've ever had them with cumin before! Hope you're feeling better soon! We did get a nice little amount of snow last night! Might need these greens to help warm us up today! 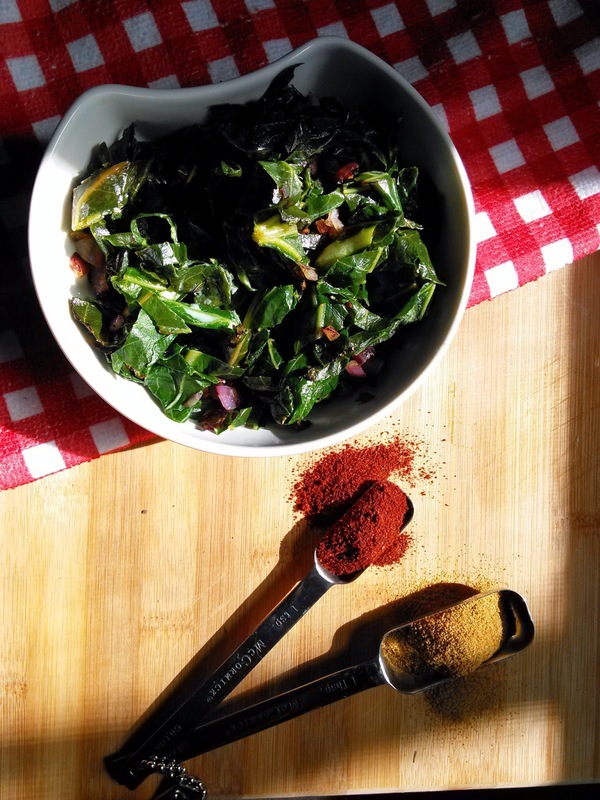 I've never had collard greens before - but I do love cumin & paprika together! I think my husband, who is from the South, would enjoy this dish. I'll have to give it a try! You mentioned a Mediterranean flavor and a few of my sister-in-law's favorite spices. I bet she'd love this! This sounds like a beauty of a side dish and perfect for get togethers. These look sooooo good, I love collard greens! I love collard greens!! I grew up with them, and must admit I didn't fall in love with them though until I was an adult. But now I just love them - your recipe looks perfect! Great idea I like healthy meals. I love meals with paprika. This recipe must try everyone.